Kid’s haven’t been out of school for very long yet, some kid’s I know just got out of school last week. But, I bet you’re already hearing “I’m bored!” or if you aren’t, you will be soon! 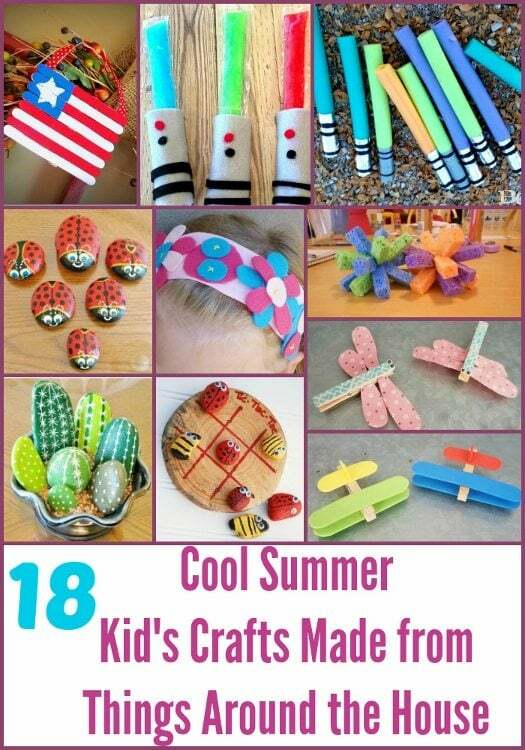 It’s always great to have things to do planned when those words come out of your child’s mouth, but it also can get very expensive sending kid’s to camp, buying toys for them to keep themselves entertained or buying craft supplies so they can be creative. The great thing about crafty is that you can take so many things that you already have around your home and use them to make something else that’s really cool! 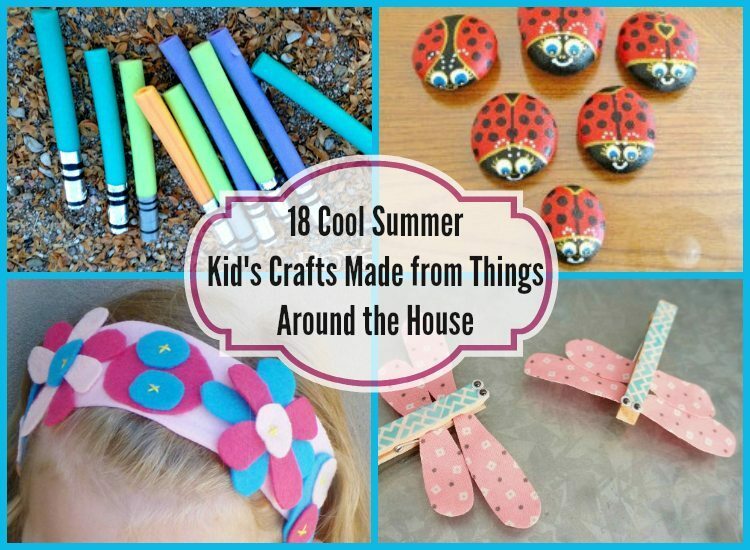 Check out these 18 Cool Summer Kid’s Crafts Made from Things Around the House to keep your kid’s busy this summer! One of the best crafts that my son ever did at school was when he painted a rock to look like a ladybug for my garden. I loved it so much and even though it’s faded outside and seen better days, it’s still out there and I think of my son every time I see it! You can make your own Painted Rocks with your kids and let them get creative on what they paint on the rocks. And while you are choosing rocks to paint, set some aside for a fun game of Pet Rock Tic-Tac-Toe. If you’ve been a reader of DIY Inspired, you know that Dinah is fantastic at taking things she has around the house or finds at thrift stores and upcycling them into something awesome. Her kid’s crafts are no different! If you have clothespins (which you can also pick up at the dollar store), check out how you can turn them into airplanes and also into dragonflies! So many of us are traveling this summer…why not make a DIY Kids Travel Chalkboard before you go? Grab an old T-shirt but don’t throw it away! Turn it into a No-Sew Recycled T-shirt bag! There’s no need to spend a lot of money on toys for creative play. Your kids can pretend they are camping indoors with a fun indoor (pretend!) campfire, used from things around the house & a few free printables. Turn your favorite summer adventure pictures into an easy popsicle stick puzzle that you & your kids can do over and over again. And speaking of popsicle sticks, you can also use them to make a fun 4th of July Popsicle Stick American Flag. If you have an empty cereal box lying around, you and your kids can decorate it and create their own little purse! Summer is HOT so why not head on over to the dollar store, pick up some new sponges and make Sponge Water Bombs to keep everyone cool? We always have empty milk cartons in our house. You and the kids can turn them into Milk Jug Summer Flowers for your garden. Continuing the flower theme, you can take magazines that you are finished reading and turn them into flowers, too. What can your kids make from old, stained T-shirts & felt scraps? How about an adorable Easy Flowered Headband? Pool noodles are in every store you go into, even the dollar store. Pick up a few extra to make some Pool Noodle Swords. Take your old coffee cans and turn them into Tin Can Stilts, just like we used to have when we were kids. Kids drink a lot of juice boxes, especially when it’s hot out. Recycle those boxes and make some Juice Box Boats. you kids will love decorating them! I always have a lot of felt in my crafts supplies and now I have something amazing to use it for. Lightsaber Popsicle Holders are going to be a hit in my house! Take a look around your house and find things that you aren’t using anymore. See how you and your kids can turn them into something else that’s great. Tara's website, A Spectacled Owl, was voted one of the Top 10 Product Reviews blogs at Voiceboks. A Spectacled Owl is a lifestyle and parenting blog based in San Diego, CA where you’ll find a mix product reviews, giveaways, crafts/DIY, recipes, articles on homeschooling and so much more. Tara has been lucky to work with amazing companies like Walmart, Best Buy, Mattel, Virgin Mobile and many more! Love the painted rocks! I’m going to make some with my kids and put them in our front yard landscaping. Thank you for including my Indoor Camping! I love doing summer crafts with my kiddos when they’re off from school. Thanks for including my easy magazine flowers.